I describe this only for systems running windows. Linux users should know how to adopt this to their system. Depending on your available hardware programming the bluetooth adapter is simple. You need a serial interface with levels of approximately 3,3 Volts. 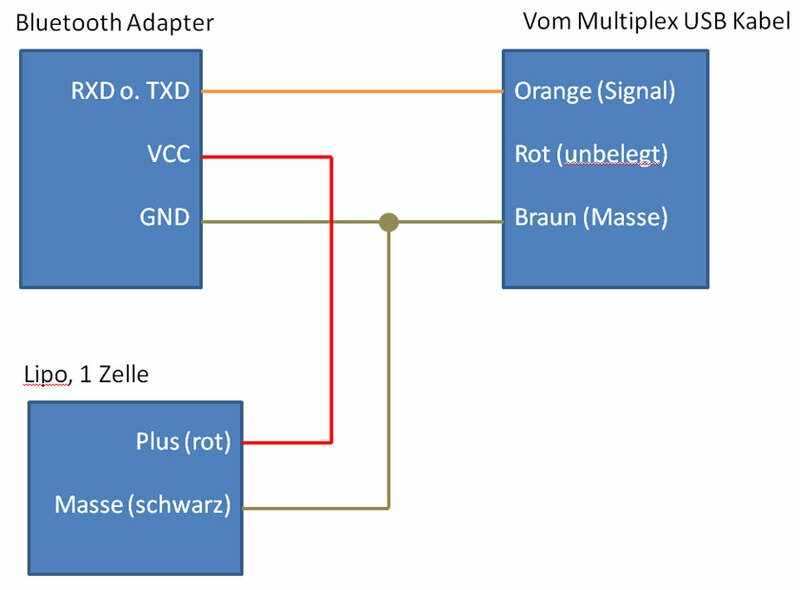 I use the multiplex® "USB PC_Kabel RX-S (UNI)" (article number 85149) that you need also to update receivers and program m-link sensors. Instead of a lipo with 1 cell you can use any power source with a stabilized output of 3,3 to 6 volt (with the adapters you find e.g. on ebay). You even can use the "+" and "-" connectors from your transmitters hf module. If you have connected everything right the led on your bluetooth adapter should blink. That signs that the adapter is working. Now you need a terminal emulator software for your pc. I used HTerm as it provides all needed functions (and more) and is available at no fee (a linux version exists too). Now click on "Connect". 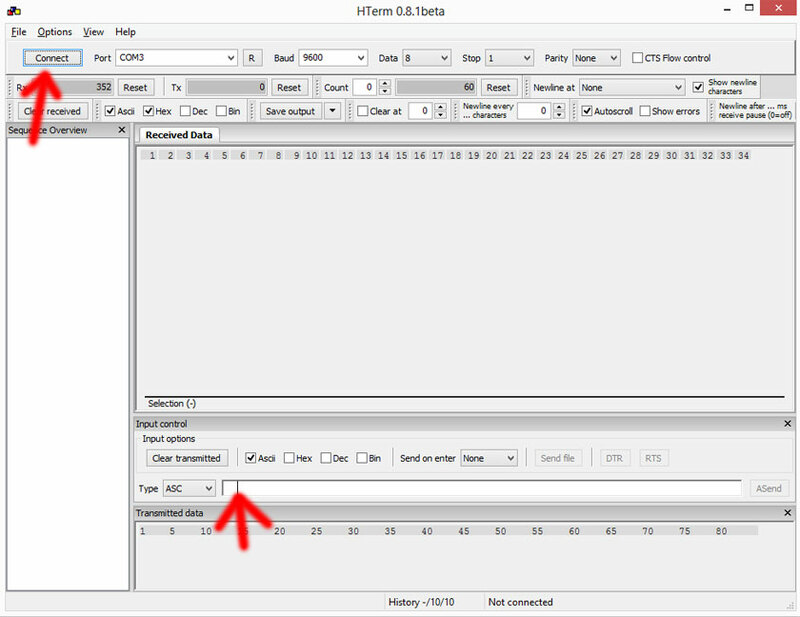 Further below in the hterm window there is an input field with which we can send data to the adapter. It is important to activate "Ascii" and set "send on enter" to "none". Press the enter key while watching the led on your bluetooth adapter. If you got the right connector you should notice a short change in the blink pattern of the led. We can try if this has worked: With your android device try to connect the bluetooth device (e.g. in android bluetooth settings). Click there on "find devices". The adapter should appear with the name you choose. If this does not work try again after disconnecting and reconnecting power supply for the adapter. If it still does not work you maybe got the wrong pin (rx vs. tx). Swap and try again. You should watch the adapters led and notice the change in blinking. That's all. You now can connect the module to your transmitter and include it into somewhere in the housing. After setting the baudrate your connection to the adapter over the serial port no longer works! To change programming you have to disconnect, set the baud rate to 115.200 in hterm and reconnect as the serial port of the adapter now works with the newly configured baud rate of 115.200.